National Operating Center - SISProsegur Ltd. , SISCO Ltd.
National Operating Centre (NOC) is the centralized team for vehicle tracking and movement control in sensitive areas like vaults and cash processing and sorting premises. All of SIS Prosegur Cash Services’s branches and vaults across India are connected to the national operation centre. 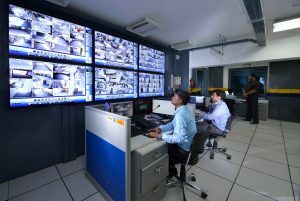 We integrate access controls, CCTV and intelligent video analysis systems, indoor and perimeter alarms and other systems into a single control centre which is monitored 24 X 7 by our dedicated surveillance team. All vaults and main branch offices can be centrally monitored through the NOC. Any entry or exit in these areas has to be duly authorized by the Control Team. In order to open or close any vault, the NOC officials provide a OTP (One Time Password) to the local staff in order to warrant their entry. In case attempts are made to override the vault access process (unauthorized access), the vault is automatically locked-down making breach impossible through the door. Real-time vehicle positions, camera feeds (from all enabled branches) is directly accessible to our central surveillance team who can monitor movements, restrict access and take appropriate actions.